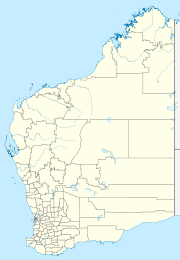 Bencubbin is a town in Western Australia in the North Eastern Wheatbelt, 275 km north-east of Perth. The town lies within the Shire of Mount Marshall and is home to approximately 294 people as of 2011. Surveyor General John Septimus Roe first surveyed the region in 1836 and he was followed by sandalwood cutters and stockmen, but it was not until 1908 that the first permanent settlers arrived. The name "Bencubbin" comes from the Aboriginal word for "place of the snakes" and is now applied to the rock to the north of the town. The aboriginal word is generally spelt "Gnylbencubbing" and is not the rock known as Mount Marshall. Mount Marshall is south-east of Bencubbin, whereas the rock known as Gnylbencubbing is at the northern edge of the township. Mount Marshall is named after Captain Marshall MacDermott, who was the first manager of the Western Australian branch of the Bank of Australasia. These two rocks and Wiacubbing Hill are three of the largest outcrops around Bencubbin. The name was suggested for the railway station at terminus of the Wyalkatchem to Mount Marshall railway line, by J Hope, the Chief Draftsman, in 1913. The townsite was gazetted later in 1917. The first Bencubbin police station was founded in 1923. In 1932 the Wheat Pool of Western Australia announced that the town would have two grain elevators, each fitted with an engine, installed at the railway siding. The town supermarket was destroyed by a fire in 2006 which started early in the morning. The fire was brought under control in two hours causing no injuries and causing over A$100,000. Bencubbin, along with the town Beacon make up the shire of Mt. Marshall which falls under the electorate of Durack. The Shire of Mt Marshall has 7 elected Councillors who are elected by the residents of the Shire on the third Saturday in October every second year. The Council meets to address the issues of the shire on the last Tuesday of every month. According to the 2011 census conducted in Western Australia in 2011, 90.1% of the population of bencubbin were born in Australia. The predominant ethnicity of Bencubbin consists mainly from immigrants of British and Irish heritage who settled in the region from the 1890s on wards. Due to such a large influx of immigrants from western Europe, the main religion today in Bencubbin are denominations of Christianity, specifically Anglican (35.1%), Catholic (18.9%), Uniting Church (9.1%) and 21.3% state no religious affiliation. English is the most commonly spoken language with 96.2% of the township speaking only English. The Bencubbin township participates in numerous sporting leagues including golf, cricket, hockey, netball and the most popular being Australian football, a code of football indigenous to Australia http://www.bencubbin.com/pages/sporting-clubs.php. The Bencubbin football club, known colloquially as the demons, participates in the central Wheatbelt football league. An amateur sporting league that consists of six clubs from surrounding townships who have competed against each other since 1968, where Bencubbin was a founding member of the league. Bencubbin have won five premiership titles in their history which is third highest overall in the league. Making Bencubbin infamous in the field of geology was the discovery in 1930 of 58 kg, rare and previously unknown type of meteorite which was aptly named "the Bencubbin". It was uncovered whilst ploughing on newly cleared land destined to be a wheat farm just 15 kilometers north-west of Bencubbin. fragments of the meteorite reside in the Smithsonian Institution, Washington D.C.
^ Australian Bureau of Statistics (25 October 2007). "Bencubbin (State Suburb)". 2006 Census QuickStats. Retrieved 28 September 2008. ^ York, Joshua. "mr". qpzm. ^ Western Australian Land Information Authority. "History of country town names – B". Retrieved 28 September 2007. ^ "Country elevators". The West Australian. Perth: National Library of Australia. 6 July 1932. p. 10. Retrieved 6 April 2013. ^ "Fire destroys Bencubbin supermarket". Australian Broadcasting Corporation. 31 August 2006. Retrieved 21 March 2013. ^ "CBH receival sites" (PDF). 2011. Archived from the original (PDF) on 18 March 2012. Retrieved 18 April 2011. ^ York, Joshua. "Our Councillors". Mt. Marshall.wa.gov.au. Shire of Marshall. Retrieved 21 February 2018. ^ "Bencubbin Demographics (WA) Local Stats". /bencubbin.localstats.com.au. ^ Devaney, John (2008). The Full Points Footy Encyclopedia Of Australian Football Clubs Volume Two. p. 61. ISBN 9780955689734. ^ Marty, Bernard; Kelley, Simon; Turner, Grenville (2010). "Chronology and shock history of the Bencubbin meteorite: A nitrogen, noble gas, and Ar–Ar investigation of silicates, metal and fluid inclusions". Geochimica et Cosmochimica Acta. 74 (22): 6636–6653. doi:10.1016/j.gca.2010.05.035. ^ York, Joshua. "Bencubbin meteorite". Western Australian Museum. Western Australian Museum. Retrieved 21 February 2018. This page was last edited on 24 November 2018, at 23:08 (UTC).